June—Instead of the Annual County Declamation contest that is usually held in Garrett County, this year there will be a County debate. The subject for debate is: "Resolved, That it should be the policy of our nation to invest more power in the Federal Government." The two debating teams are composed of one member from each of the six high schools in Garrett County. Grantsville, Friendsville and Accident are on the affirmative side; on the negative, Kitzmiller, Oakland and Kempton. The debate which has aroused the interest of all the schools in the county will be held early in June. Those who participated in the Oakland High School debate were: Affirmative, Jacqueline Lockyer, Donald Moore, Lewis Wildman, Joseph Sollars; negative, Elizabeth Gibson, Susanna Dixon, Willa Harvey, Rozelle Brenneman. ADDITION MADE TO O. H. S.
The Oakland High School for several years past has been so overcrowded that it was almost impossible to carry on classes and school activities in the proper way. 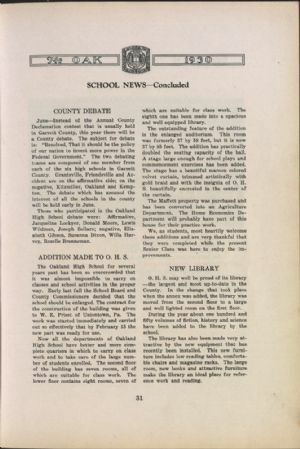 Early last fall the School Board and County Commissioners decided that the school should be enlarged. The contract for the construction of the building was given to W. E. Priest of Uniontown, Pa. The work was started immediately and carried out so effectively that by February 15 the new part was ready for use. Now all the departments of Oakland High School have better and more complete quarters in which to carry on class work and to take care of the large number of students enrolled. The second floor of the building has seven rooms, all of which are suitable for class work. The lower floor contains eight rooms, seven of which are suitable for class work. The eighth one has been made into a spacious and well equipped library. The outstanding feature of the addition is the enlarged auditorium. This room was formerly 37 by 58 feet, but it is now 37 by 85 feet. The addition has practically doubled the seating capacity of the hall. A stage large enough for school plays and commencement exercises has been added. The stage has a beautiful maroon colored velvet curtain, trimmed artistically with gold braid and with the insignia of O. H. S. beautifully encrested in the center of the curtain. The Maffett property was purchased and has been converted into an Agriculture Department. The Home Economics Department will probably have part of this house for their practice work. We, as students, most heartily welcome these additions and are very thankful that they were completed while the present Senior Class was here to enjoy the improvements. O. H. S. may well be proud of its library —the largest and most up-to-date in the County. In the change that took place when the annex was added, the library was moved from the second floor to a large and well lighted room on the first floor. During the year about one hundred and fifty volumes of fiction, history and science have been added to the library by the school. The library has also been made very attractive by the new equipment that has recently been installed. This new furniture includes low reading tables, comfortable chairs and magazine racks. The large room, new books and attractive furniture make the library an ideal place for reference work and reading.